Published 2013-12-19 in sections English, Digital World. Randall Munroe rightly put shame on all the geeks in the world when he pointed out that transferring files over the internet is still an unsolved problem. It works without additional dependencies (but better with python-magic installed) and requires a publicly available SSH server configured with GatewayPorts clientspecified. 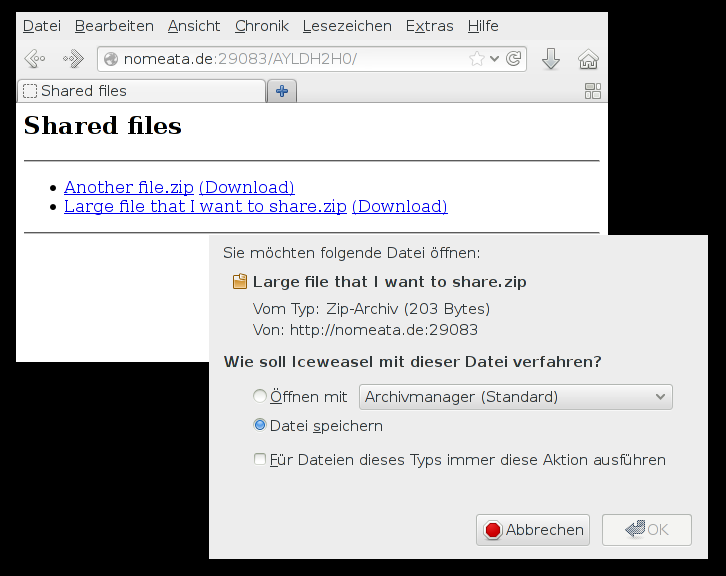 For more details, see the README, and to try it out, simply fetch it with git clone git://git.nomeata.de/share-file.git. BTW, if someone implements a command line client for FileTea, I’ll happily dump share-file for it. I’m basically doing that, only that the webserver is available on a different host. Usually, my laptop is not publicly available, so python -m SimpleHTTPServer alone will not help. I did not know about filetea. I am the author of Fipes  a web application that seems to solve the problem in the exact same way. I think there is no technical difficulties to solve the 949 problem (however we can argue on the definition of "fixing" here). We need to make people more aware of the fact that free software solutions exist. If I had found that before I wouldn’t have created share-file... thx for it! It only existed after I read the post on HN this morning. It was a fun challenge, and I'm glad you can put it to some use. btsync has pretty much solved it. I had a similar idea for Emails, but never got around to actually implement it. I thought it would be a good idea to strip of binary attachments, put them on a webserver and replace them with a link to the file. To avoid potential security risks, the link to the file should be a shaXXX sum. Of course, if someone wanted real security, they should encrypt their files. I think your solution is a step to that direction. It could probably be easily used as a postfix filter. I think e-mail attachments are a bit different. For example, when do you know when you can stop serving the file? to generate the random string. Oh my, I completely forgot about this, sorry. Several solutions for obsolete files come to my mind.